A chance meeting of Artist George Stromer and Howard Wilson. 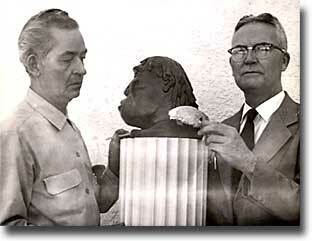 Sculptor George Stromer with Dr. J.J. Marky holding the Laguna Skull. In 1953, Howard was reading the local newspaper, The Laguna Beach South Coast News, and in it was an article that set him to thinking. The article concerned a local sculptor, Mr. George Stromer, who had been sculpting the heads of prehistoric men, using the archaeologic skulls as the basis for his approach. Using an exact copy of these skulls as the foundation for his work, Mr. Stromer would add what he thought was the clay equivalent of muscle and skin over top of it, resulting in a hopefully realistic portrayal of the the original owner of the skull. He was trying to bring ancient man to life. Howard contacted Stromer, and offered the Laguna skull to him to model, and Stromer readily agreed. The model he produced showed more about the artistic thinking of Mr. Stromer then it did of the reality of the Laguna skull. While the size of the brain case was approximately correct, the other features were the product of a fertile artistic imagination. He produced the likeness of a small-brained man with strong projecting eyebrow ridges and an unusually large and forward thrusting jaw. This incorrect model resulted from both preconceived notions of what a primitive man "should" look like, coupled with the fact that there was nothing to the actual skull below the midpoint of the eyesockets with which to base his model upon. But this chance meeting of Howard and Mr. Stromer did more then produce a fancy sculpture. It set in motion a chain of events which eventually took the skull to Museum of Man in Paris, the Smithsonian Institution in Washington DC, through the hands of the famous Dr. Louis Leakey, and finally to the high-tech Carbon 14 Dating facilities of the UCLA Geophysics lab. The age of the skull was going to be answered - but not for another 15 years!